Purdue University has been awarded $70 million to lead a consortium to co-create research solutions for developing countries. Purdue University professor Arvind Raman, speaking, will co-direct a new center to support USAID in navigating developmental challenges in lower-middle income countries. A billion people live in extreme poverty, mostly in low- and middle-income countries, suffering from hunger and malnutrition, poor health, limited education and marginalization or exclusion. Progress is exacerbated by other challenges such as political crises, conflicts and natural disasters. To support the United States Agency for International Development as they navigate developmental challenges in these countries, Purdue will lead a multi-university consortium devising evidence-based solutions. The consortium, announced Wednesday (August 29) as the Partners for University Led Solutions Engine (PULSE), is the winning bid out of more than 100 submissions for USAID's new Long-Term Assistance and Services for Research (LASER) agreement, which will leverage the resources and expertise united by the center to co-create research solutions for pressing development challenges. USAID will support PULSE as a LASER center with an up to $70 million cooperative agreement over the course of five years. 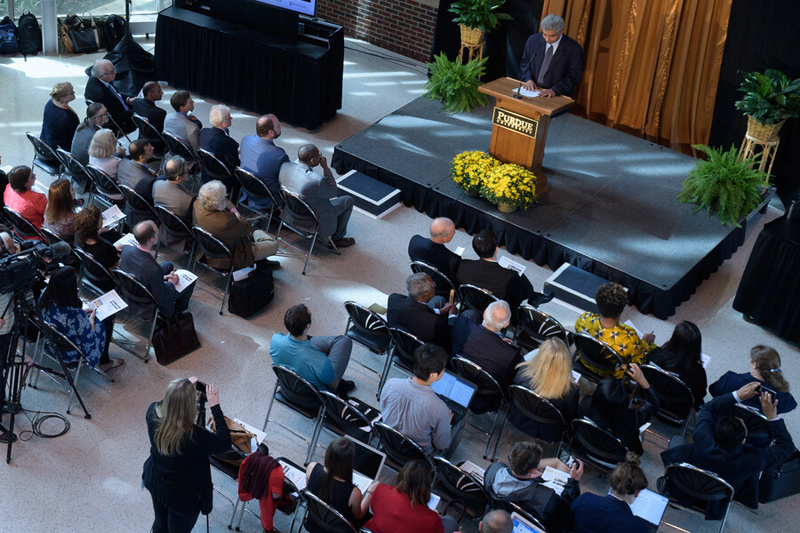 The announcement coincides with Purdue's 150th anniversary, which celebrates the university’s “giant leaps” made in health as well as in space, artificial intelligence and sustainability. Those are the four themes the yearlong celebration’s Ideas Festival designed to showcase Purdue as an intellectual center solving real-world issues. 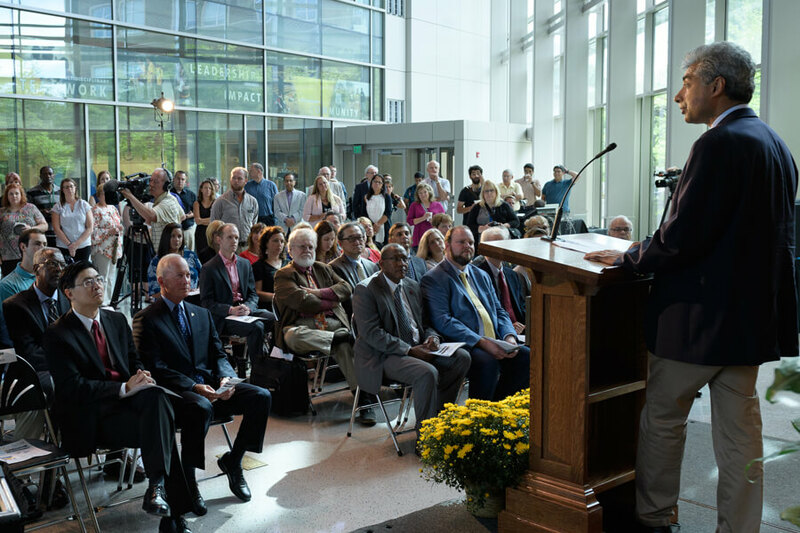 “PULSE will help make Indiana a hub for development research,” said Arvind Raman, the academic director of the consortium, Purdue's senior associate dean of faculty and the Robert V. Adams Professor in Mechanical Engineering. The consortium will help USAID to identify research challenges across all its technical sectors and geographical locations and identify experts worldwide to answer these questions to a network of more than 50 higher education institutions around the world. Aside from food security and global health, questions could range from how to customize an early childhood education program to each country's needs, to monitoring the impact of water availability on wildlife conservation or assessing the relationship between land-tenure rights and countering violent extremism. Purdue’s supporting partners in the consortium are two universities in Indiana – Indiana University and the University of Notre Dame – as well as Catholic Relief Services and Makerere University in Uganda. Each university in the consortium will support the program, with Catholic Relief Services translating the findings into development solutions in a network of more than 120 countries. Makerere University, the lead institution in the ResilientAfrica Network, supports 17 institutions in the Horn of Africa, South, East and West Africa. PULSE will also help USAID continue to build capacity of higher education institutions to undertake development research with the support of local governments and the private sector. The consortium has a corporate advisory board to leverage private sector interest, including General Electric Energy, General Electric Healthcare, Dr. Reddy’s Labs, Dow Agrosciences, Cargill, Land O’Lakes, Procter and Gamble, PepsiCo, Cisco, Infosys, Tetra Tech and Chemonics. “The private sector will bring a business lens to research identification. In turn, they may co-finance some research in cases where there is a clear overlap in interests, such as exploring consumer behaviors in emerging markets or opportunities for reverse innovations,” said Yuehwern Yih, co-academic director of the consortium, associate director of the Regenstrief Center for Healthcare Engineering in Discovery Park and professor of industrial engineering. PULSE includes a faculty fellows program that will recruit faculty from each consortium member university as experts in food security, water, global health, infrastructure, microfinance policy and other topics to assist with various aspects of the center and network activities. “Many of Purdue’s partners in lower-middle income countries are already in PULSE’s higher education institutions network. Not only will these partners have the chance to be funded for development research projects and build the capacity for doing so, but they will also get to involve collaborations with the consortium’s member universities,” Raman said. The program and network will continue to grow, adding new researchers and expertise to adapt to ever-changing challenges in international development.